It looks like current "spin" findings and discoveries on "Atomic Magnetism" at the nano-level are creating a lot "curious" papers in recent years. (Nanowerk News) Superconductors raise many hopes, especially materials which lose their electrical resistance at quite high temperatures – be it for high-performance medical imaging technologies, the energy transportation or for maglev trains. High-temperature superconductors which deserve the name could find many applications. However, their fascination bears no relationship to the ongoing mystery of their actual nature; this has so far hindered the search for zero-resistance conductors for realistic temperatures. Scientists from the Max Planck Institute for Solid State Research in Stuttgart and Augsburg are making their contribution to a more detailed understanding of how iron-based superconductors work and the role played by magnetism. They are the first to have imaged the magnetic structure of a so-called strongly correlated electron system, here of iron telluride, on an atomic scale ("Real-space imaging of the atomic-scale magnetic structure of Fe1+yTe "). Prior to this, information about the magnetic structure was provided only by neutron diffraction, but the image it produced was imprecise. Iron telluride is the non-superconducting parent compound of the iron chalcogenide superconductors. The researchers now hope to be able to apply the method to materials which exhibit both superconducting and magnetic properties in order to find out more about the relationship between magnetism and superconductivity. Substances such as copper oxide ceramics or iron arsenic compounds are deemed to be high-temperature superconductors: they do not have to be cooled as much as other materials in order to render them superconducting. Why is this? To date there are hypotheses, but no proven description of the precise processes. “A key question which many research groups are now posing is the one about the relationship between magnetic and superconducting properties of these materials,” says Peter Wahl from the Max Planck Institute for Solid State Research and University of St Andrews. “Can both effects occur at one and the same location? Or are they mutually exclusive?” Physicists think it is possible that the magnetic properties of the materials could even be the cause of their superconductivity. In order to examine this, researchers have long been looking for a procedure that allows characterization of the magnetic structures in these strongly correlated electronic materials on the atomic scale. The method of neutron diffraction has so far been the tool of choice for investigating the magnetic order, but it provides only spatially averaged insights into the magnetic structure. The Stuttgart-based Max Planck researchers have now made use of a so-called spin-polarised scanning tunneling microscope, which can image the orientation of the magnetic moments of individual atoms. The method is not new, but has so far mostly been applied to metal surfaces and nanostructures. What was not clear until now was whether the method could be used to clarify the magnetic structure of a strongly correlated system such as iron telluride. This is because the top layer of this material consists of tellurium, an element which itself is not magnetic. The scientists have now shown that the spin-polarised scanning tunnelling microscope can also be applied to strongly correlated electron materials despite their complex chemistry. The iron lattice below most likely exerts too great an influence. Narrow longitudinal stripes, which result from the anti-ferromagnetic order in the iron telluride, can be recognised in the image taken by the scanning tunnelling microscope. Within the stripes, all magnetic moments have the same orientation; on the adjacent stripes, it is in the opposite direction. An experimental challenge was to magnetise the tip of the microscope for the spin-polarised investigations. To study nanostructures on surfaces, researchers primarily achieved this by heating the tip of the microscope and vapour depositing magnetic material on it. 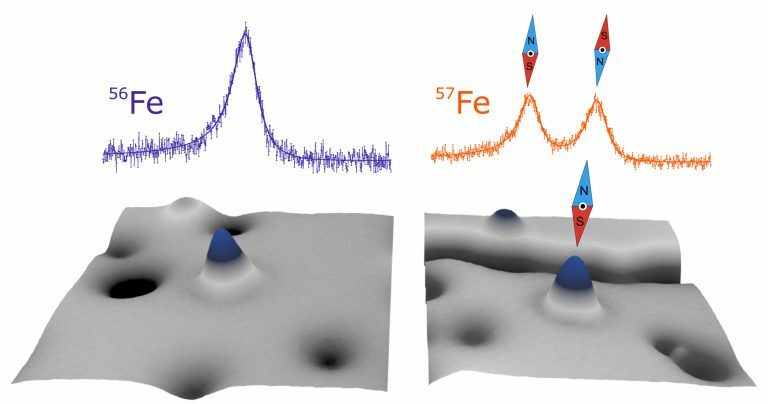 To avoid the need for this technologically demanding procedure, the scientists used a trick: they picked up individual iron atoms on the surface of the iron telluride under investigation with the tip of the microscope, until it became magnetic. In this way, they could image the magnetic stripe order in iron telluride with atomic resolution in real space. The researchers made an interesting observation on the temperature which is necessary for the anti-ferromagnetic structure to form. In the experiment, this was approximately minus 227 degrees Celsius, around 20 degrees lower than the temperature that is normally necessary. The reason for this is that the researchers observed only the surface of the iron telluride in their experiment. Compared to the iron telluride layers in the bulk of the material, the interactions with an atomic layer above it are missing here. Consequently, the magnetic moments cannot mutually stabilise their order as well – the magnetic structure forms only at a lower temperature. The Research Group lead by Peter Wahl also determined that the magnetic order becomes more complex when the proportion of iron atoms is higher: the longitudinal stripes partially dissolve, and are overlaid by transverse stripes. It seems that the surplus atoms and their magnetic moments mess up the magnetic. “There is still a great potential for research here,” says Peter Wahl. “I believe that a real boom is going to develop very soon, groups will be carrying out similar experiments on other materials at the boundary between superconductivity and magnetism.” Understanding the properties of these materials would be the first step towards superconducting technology which is more energy efficient, and eventually may even be suitable for routine application. As this gets better, it might be possible at some point to just map Mathis' structures onto many of their images? IBM has a lot of papers coming apparently. Our team at IBM Research − Almaden in Silicon Valley has detected the magnetism of a single atom’s nucleus, a feat that opens the door to using the nucleus as a way to sense and control magnetism at the atomic scale. This breakthrough, recently published in the journal Science, was achieved by measuring the magnetic effect of the nucleus on the electrons in the same atom. The study reveals information about the isotope – the number of neutrons in an atom’s nucleus – and how the atom’s magnetization depends on its neighboring atoms, providing a powerful new tool for sensing at the nanoscale and presenting a major step toward using the nucleus for future spintronics. Figure 1: Sketch of the experiment. Each red ball represents a magnetic atom bonded to a surface. Some naturally have a nuclear spin, a small magnet, in their core. The sharp tip of a STM probes a single magnetic atom. Image courtesy QNS. Working with an international team of collaborators including the Center for Quantum Nanoscience (QNS), the University of Oxford and the International Iberian Nanotechnology Laboratory, we measured iron and titanium atoms that were attached to a carefully prepared surface. We used a scanning tunneling microscope (STM), the Nobel-prize-winning IBM invention that uses the tip of a sharp metal needle to scan a surface to image and move individual atoms with great precision. Three years ago, our group showed that we could detect the magnetism of the electrons of a single atom and use its sensitivity to magnetic fields as a way to detect and measure the properties of nearby magnetic atoms on the surface. Now, we have extended this to detect the much tinier magnetism of the nucleus. Figure 2: Scanning tunneling microscope image of the magnesium oxide surface, where the small protrusions are individual iron atoms. Image courtesy QNS. The interaction between an atom’s nucleus and its electrons, called the hyperfine interaction, makes it possible to detect the magnetism of the nucleus. The hyperfine interaction within each atom changed when we moved the atom to a different position or if we moved another atom close to it. We used the STM to reposition individual atoms and show that the hyperfine interaction depends strongly on chemical bonding to other atoms. For example, a titanium atom bonded to four nearby atoms yielded a much stronger hyperfine interaction than the same titanium atom perched atop a single oxygen atom. Furthermore, we found that the strength of the hyperfine interaction depends on the presence of neighboring magnetic atoms, so it reveals how the magnetism of the two atoms combine according to the rules of quantum mechanics. To detect the spin of a single nucleus, we make use of the electrons surrounding the nucleus – together the nucleus and the electrons form an atom. These electrons also have spin. For electrons, the spin results in a magnetic field that is about a thousand times larger than for the nucleus. This makes detecting the electrons much easier, but still exceedingly challenging to sense for a single atom at a time. We use an advanced form of scanning tunneling microscopy that operates in ultra-cold, clean, vibration-free conditions to ensure that the atoms stay in place and the sensitive measurements are not disturbed by heat, debris or noise. Our team detects a single atom’s spin by using an ultra-sensitive technique called spin resonance in which we use the tip of the STM to find and select a single atom to examine. Then we use electron spin resonance (ESR), which senses how fast the north pole of the electron rotates. This rotation is called precession, and the north pole moves much like the axis of a spinning top placed on a table, which slowly rotates to point in different directions. For an electron, precession happens billions of times per second, and the frequency of precession is called the resonant frequency. This frequency changes in response to subtle changes in the magnetic field experienced by the atom. Performing ESR using a scanning tunneling microscope allows us to measure the spin while seeing the position of the atom and those it is bonded to, along with the more distant atoms that subtly influence it, revealing invaluable information about the magnetic interaction at the single-atom scale, which is essential for designing advanced electronic devices made from several atoms. CR6 wrote: As this gets better, it might be possible at some point to just map Mathis' structures onto many of their images? IBM has a lot of papers coming apparently. I think that would be a worthwhile endeavor! Keep us posted, it will be interesting to see how their images correlate with Miles' diagrams.